We’d love your help. Let us know what’s wrong with this preview of Judgment and Decision Making by Baruch Fischhoff. To ask other readers questions about Judgment and Decision Making, please sign up. 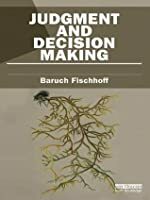 A broad collection of papers by Fischoff on judgment and decision making (as you'd expect). Some good insights that I didn't have before. Baruch Fischhoff is a distinguished academic and the Howard Heinz University Professor of both Departments of Social and Decision Sciences and Engineering and Public Policy at Carnegie Mellon University and is one of the proponents of Risk perception studies with his numerous academic books and articles on risk analysis/communication and human behavior. Honored with a 'Distinguished Achievement Awa Baruch Fischhoff is a distinguished academic and the Howard Heinz University Professor of both Departments of Social and Decision Sciences and Engineering and Public Policy at Carnegie Mellon University and is one of the proponents of Risk perception studies with his numerous academic books and articles on risk analysis/communication and human behavior.